What could be worse than your matchmaking mother trying to set you up? How about discovering she knows exactly what she's doing? This is the problem facing Vince Russo in Jess Molly Brown's hilarious debut novel, Moms on Missions. Vince, an independent visual artist living at Niagara-on-the-lake, has put his dating life on hold to save for art school. But Diana Russo needs grandchildren in her home more than another painting, so she conspires with her friends, the Moms on Missions, to find a blonde-haired, blue-eyed Italian girl to make her dreams for her son come true. The Moms find the perfect girl, Mary diGiordano, and secretly install her in the apartment upstairs from Vince, hoping sparks will fly. And sparks do fly. But not the good kind. First, Mary apparently has some obnoxious drummer named Danny for a roommate whose rude attitude makes Vince want to tear out his hair. When Vince finally meets Mary, his every attempt at kindness is met with major hostility. This Mary diGiordano is a frustrating whirlwind of contradictions and not at all who Vince thought she would be. And oh, does he think about it: who Mary is and who she could be. Thinks about it a lot more than he should...and far more than he cares to admit to his mother. For her part, Mary doesn't want anything to do with Vince either. She has a life plan of her own, and it does not include proving her Mom-on-a-Mission right by falling for the dark-haired, dreamy-eyed artist on the first floor. Who cares if he's kind and sensitive and understands her as no one else ever has? Who cares if he's strong and passionate and can protect her from the crazy fans she meets at her gigs? And who cares if he's exactly the kind of guy she could love forever? Mary cares. And it's driving her crazy. As the Moms gloat about their pending success, their confidence breeds contempt, and Vince and Mary begin to resent their interference. They decide to turn the tables on the meddling matriarchs, and the Moms wonder if their plans have backfired. And that’s what Jess Molly Brown does. She creates fun and engaging stories that make you laugh one minute and melt your heart in the next. Her supporting cast adds spice and surprise to the main events, guiding Vince and Mary toward a beautiful and touching conclusion. 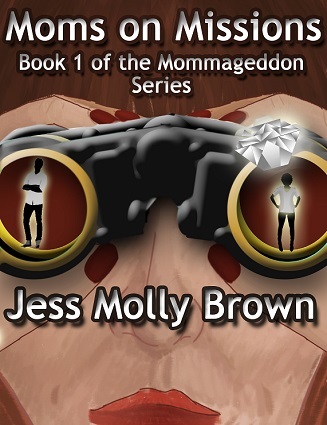 That talented touch of Jess Molly Brown is on full display in Moms on Missions and will surely follow in the MOM stories to come. Despite how their children may feel, the Moms on Missions are a force to be reckoned with, and these madcaps gals are just getting started. The same is true for the uniquely talented Jess Molly Brown, and Moms on Missions is the perfect introduction to her wildly entertaining romantic antics.